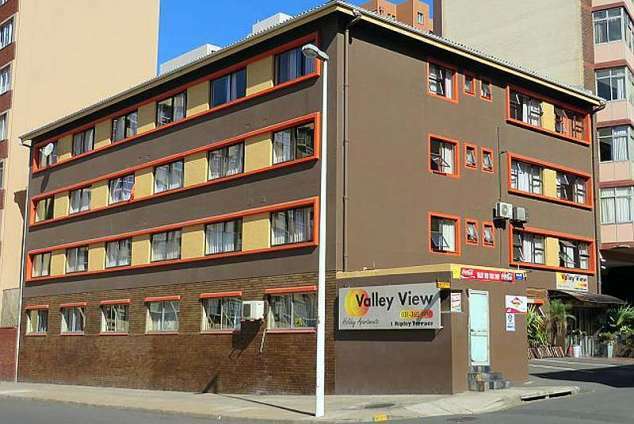 Valley View Holiday Apartments - Durban Beachfront Accommodation. Durban is blessed with a sub-tropical climate all year round making it a perfect holiday paradise. It is famed for the mild sunny winter climate and year round 'fun in the water' weather. It's South Africa's most popular coastal resort offering fun, relaxation and excellent attractions. Whether you are travelling for business or leisure, require an overnight stopover, short holiday or longer stay we are here for you. Guests can be assured of a good standard and excellent value for money. You will enjoy the friendly, relaxed and informal atmosphere of this establishment. The apartments are located one block up from popular Addington Beach and a 3-minute walk to uShaka Marine World. This self-catering apartment block offers 18 fully equipped units with a variety of 3, 4, 6, 7 and 8 bed apartments (1 to 2 bedrooms). One-bedroom unit, sleeps up to 3 people sharing. Queen bed in bedroom and single bed in open-plan lounge, one bathroom (bath with overhead shower) and kitchenette. One-bedroom unit, sleeps up to 4 people sharing. Queen bed in bedroom and two single beds in open-plan lounge, one bathroom (bath with overhead shower) and kitchenette. One bathroom (bath with overhead shower) plus fully equipped kitchenette. All apartments have ceiling fans in lounge and bedroom and limited 4 and 6 sleeper air-conditioned apartments are available. Relax in our popular wooden-decked courtyard with built-in braai/barbeque facilities. Please Note: The situation of this budget accommodation is typical of any central city around the world whereby normal safety measures should apply. 361458 page views since 08 May, 2007. Last updated on 16 Apr, 2019.